Tutorial: 0.54″ Alphanumeric Adafruit LED Backpacks « Adafruit Industries – Makers, hackers, artists, designers and engineers! 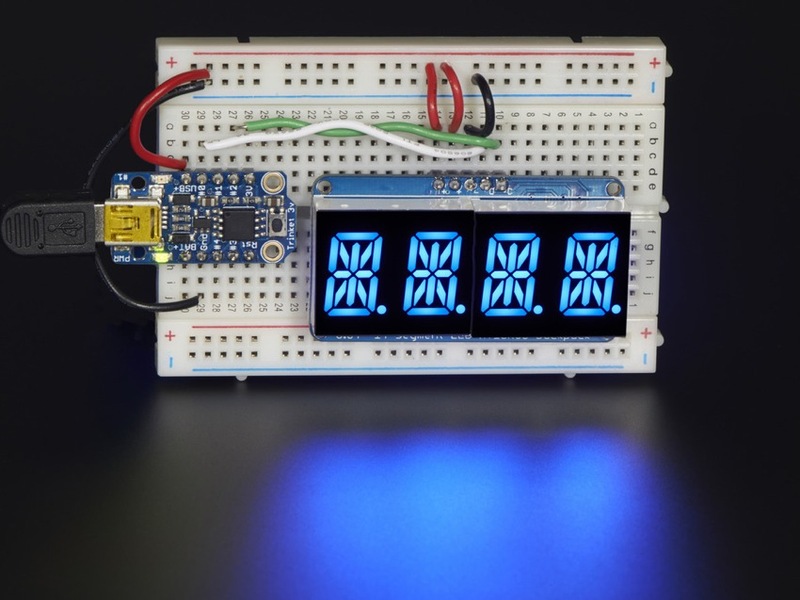 This version of the LED backpack is designed for two dual 14-segment “Alphanumeric” displays. These 14-segment displays normally require 18 pins (4 ‘characters’ and 14 total segments each) This backpack solves the annoyance of using 18 pins or a bunch of chips by having an I2C constant-current matrix controller sit neatly on the back of the PCB. The controller chip takes care of everything, drawing all the LEDs in the background. All you have to do is write data to it using the 2-pin I2C interface. There are three address select pins so you can select one of 8 addresses to control up to 8 of these on a single 2-pin I2C bus (as well as whatever other I2C chips or sensors you like). The driver chip can ‘dim’ the entire display from 1/16 brightness up to full brightness in 1/16th steps. It cannot dim individual LEDs, only the entire display at once.